Zero emissions is the cruise industry’s long term ambition, both for water and air, and not only at sea, but also in port, as profiled in the 2019 Zero Emissions Target Report by Cruise Industry News, available for free download. It may have started with wastewater discharge regulations being introduced in Alaska and the Baltic some 20 years ago, followed by air emissions restrictions in ports on the West Coast, leading to the first installations of shorepower and testing of scrubbers. Since 2015, socalled SOx Emission Control Areas established by the IMO have restricted the sulfur content in marine fuels used to 0.1 percent, and by 2020 IMO regulations puts a global sulfur cap at 0.5 percent for marine fuels (outside of ECAs), compared to a 3.5 percent limit today, which has been in effect since 2012; it was 4.5 percent before that. In order to comply, ships will have to operate on the low sulfur fuel or, if running on heavy fuel oil, use exhaust gas cleaning equipment (scrubbers), or alternative fuels, including LNG. New ships also have to comply with IMO Tier III NOx restrictions in ECA areas and Tier II everywhere else. Next comes the 2020 and 2025 Energy Efficiency Index requirements that new ships must be 20 percent and 30 percent more energy efficient, respectively, than a 2015 baseline. New ships are well on their way to meeting these targets already, resulting from more energy efficient powerplants, HVAC systems, lighting, galleys, hull forms and hull lubrication, and more, in addition to energy management plans and more efficient operations. Advanced wastewater treatment systems cleans the discharges into the sea. New developments also promise to turn garbage into energy that can be burned as fuel rather than being incinerated and going up the funnel. 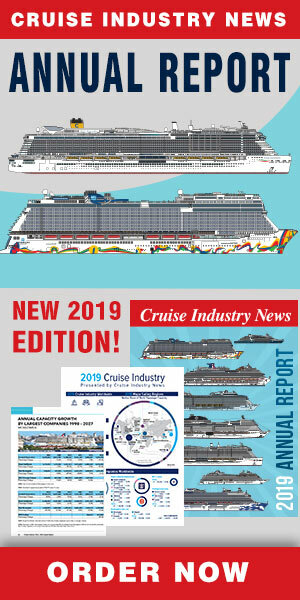 Read Now: 2019 Zero Emissions Target Report by Cruise Industry News. At the same time, port communities are becoming more concerned about air emissions from cruise ships when in port. Norwegian authorities have gone as far as to declare that their heritage fjords, that are popular with cruise ships, shall be emission free by 2025. Longer term, the IMO has set 2050 as the target date for a 50 percent reduction in CO2 emissions from a 2008 baseline and that will require more than low sulfur fuel and scrubbers. Thus, the cruise industry is actively engaged in developing technologies and fuels to reduce emissions both at sea and in port. So far, the focus is on LNG as the “next” fuel, but work is also underway advancing fuel cell and energy storage technologies and fuels such as hydrogen, methanol and ammonia for ship applications, as well as solar and wind power. The path to zero emissions ships may be long, but the technology insiders are confident the industry will get there.